1.1 This Standard Radio System Plan (SRSP) states the minimum technical requirements to operate multipoint communications systems (MCS) in the bands 928-929/952-953 MHz and 932-932.5/941-941.5 MHz. 1.2 As these bands are shared with the U.S. in the border area, coordination between Canada and U.S. is required in certain portions of the bands to prevent harmful interferenceFootnote 1 and to ensure equal access by both countries. The sharing arrangements between Canada and the U.S. for the usage of these bands are also described in this Standard. 1.3 This Standard is intended to be used for the evaluation of licence applications for new radio facilities or modification to radio systems submitted in accordance with the current issue of Radio Standards Procedure RSP 101. 1.4 This Standard specifies equipment characteristics relating to efficient spectrum usage only and is not to be regarded as a comprehensive specification for equipment design and/or selection. 2.1 Revision of this Standard will be made as required. 2.2 Although a radio system conforms with the requirements of this SRSP, the Department may require modifications to the system whenever harmful interference is caused to other radio sites or systems, except when such interference is due to inadequate receiver selectivity as dealt with in Section 2.3. 2.3 The Department reserves the right to limit protection to licensed radio receivers only to the extent of bandwidth of the transmitters whose emissions they are licensed to receive. For example, full protection is not granted to operators using a receiver which is designed for use on a 25 kHz channel but operating on a 12.5 kHz channel. Licensees and/or applicants should use receiver selectivity characteristics or filters that provide rejection of harmful interference. 2.4 Radio systems conforming to these technical requirements will be given priority in licensing over non standard radio systems, that is to say those systems which do not conform to the most recent issue of the spectrum utilization policy (SP), radio systems policy (RP) or the SRSP, or which are authorized while an SRSP is under preparation. The provisions for such non-standard systems are outlined in SP-GEN (see 3.1.6). 2.5.2 Remote Station — a station which is either controlled, activated, or interrogated by, and may respond to, a master station or transmit one-way to a master station. 2.5.3 Multipoint Communications System (MCS) — a system consisting of a central radio station communicating on a one or two-way basis with associated remote sites. Application Procedure for Planned Radio Stations Operating on Frequencies Below 960 MHz. Land and Mobile Stations, 27.41 to 960 MHz, 20-30 kHz Channelling. Land and Mobile FM or PM Radiotelephones Operating in the 400-960 MHz Bands Using 12.5 kHz Spacing. Spectrum Utilization Policy for the Fixed, Mobile, Radiolocation and Amateur Services in the Band 896-960 MHz. General Information Related to Spectrum Utilization and Radio System Policies . Notes Regarding Designation of Emission (Including Necessary Bandwidth and Classification), Class of Station and Nature of Service. 4.1 The administrations of Canada and the United States have concluded arrangements for the sharing of spectrum along the border in the bands 928-929/952-953 MHz and 932-932.5/941-941.5 MHz. The sharing arrangements are summarized in Table 1. The coordination zone is illustrated in Figure 1.
at existing co-channel master stations of the other country, or as mutually agreed upon on a case-by-case basis. Coordination is not required if the pfd at the border is lower than -100 dBW/m2. New master stations will be notified by Industry Canada to the U.S. administration if protection is required. The United States has full use of frequencies within these bands. Canada may also use these frequencies on an unprotected basis, provided the stations are limited to a pfd of -100 dBW/m2 at or beyond the United States border. Canada has full use of frequencies within these bands. The United States may also use these frequencies on an unprotected basis, provided its stations are limited to a pfd of -100 dBW/m2 at or beyond the Canadian border. Use of frequencies within this band is governed by the provisions of established coordination procedures, rather than this arrangement. Within the coordination zone, frequencies in this band are available in Canada on a coordinated, shared basis. The coordination zone illustrated in Figure 1 is applicable. In addition to the above mentioned provisions, all frequency assignments in the bands 928-929 and 952-953 MHz must protect existing stations in both countries. Canada has full use of frequencies within these bands. The United States may also use these frequencies on an unprotected basis, provided its stations are limited to a power flux-density (pfd) of -100 dBW/m2 at or beyond the United States-Canada border for the frequency band 932-932.25 MHz and -94 dBW/m2 at or beyond the United States-Canada border for the band 941-941.25 MHz. The United States has full use of frequencies within these bands. Canada may also use these frequencies on an unprotected basis, provided its stations are limited to a pfd of -100 dBW/m2 at or beyond the United States-Canada border for the frequency band 932.25-932.50 MHz and -94 dBW/m2 at or beyond the United States-Canada border for the band 941.25-941.50 MHz. no coordination needed if less than -100 dBW/m2 at border. Unprotected usage, provided stations are limited to -100dBW/m2, except for the band 941.25-941.50 MHz where stations are limited to -94 dBW/m2, at or beyond the United States-Canada border. Full, uncoordinated use, but must protect existing, grandfathered stations for United States for the bands 928.50-928.75 MHz and 952.50-952.75 MHz. In accordance with established coordination procedures*. Full, uncoordinated use, but must protect existing, grandfathered stations for Canada for the bands 928.25 928.50 MHz and 952.25 - 952.50 MHz. Unprotected usage, provided stations are limited to -100 dBW/m2, except for the band 941-941.25 MHz where stations are limited to -94 dBW/m2 , at or beyond the United States-Canada border. In accordance with established coordination procedures*. 5.1 Two modes of operation are normally permitted for multipoint communications systems: one way (from master station to remote sites or from remote sites to master station); and two way (from master station to remote sites and from remote sites to master station). 5.2 Frequencies for multipoint communications systems in the bands 928-929 MHz and 932-932.5 MHz are paired respectively, except as specified below, with those in the bands 952-953 MHz and 941-941.5 MHz. The lower frequency bands are designated as "remote transmit" and the higher frequency bands "master transmit". 5.3 The RF channels listed for the bands 928-929 MHz and 952-953 MHz that have been designated for MCS duplex operation can be found in Tables 2 and 4. Similarly, the RF channels that have been designated for simplex operation can be found in Tables 3 and 5. The RF channels listed for the bands 932-932.5 MHz and 941-941.5 MHz, designated for MCS duplex operation, can be found in Table 6. 5.4 For the bands 928-929 MHz and 952-953 MHz, the channelling plan is based on both 12.5 kHz and 25 kHz RF channel spacings with the 12.5 kHz RF channels spaced ±18.75 kHz from the 25 kHz RF channels when both RF channels operate in the same geographical area. RF channels with 12.5 kHz or 25 kHz channel spacing may be available upon request. For the bands 932-932.5 and 941-941.5 MHz, the RF channel spacing is 12.5 kHz. 5.5 In the MCS bands 928-929 and 952-953 MHz, RF channels will be assigned commencing at the lowest available frequency for 25 kHz RF channels and at the highest available frequency for 12.5 kHz RF channels on a first-come first-served basis. 5.6 Requirements for greater than 25 kHz RF channel bandwidths, in the bands 928-929 MHz and 952-953 MHz, may be allowed on a case-by-case basis (see RSP 101) at the discretion of the Regional Executive Director. Upon adequate justification, additional channels may be combined to accommodate systems requiring higher data rates. Channel bandwidths exceeding 50 kHz are not permitted unless the applicant can demonstrate that greater spectrum efficiency is achieved by using the larger bandwidth. Similarly, requirements for greater than 12.5 kHz RF channel bandwidths, in the bands 932-932.5 MHz and 941-941.5 MHz, may be allowed on a case-by-case basis (see RSP 101) at the discretion of the Regional Executive Director. Upon adequate justification, additional channels may be combined to accommodate systems requiring higher data rates. Channel bandwidths exceeding 25 kHz are not permitted. 5.7 Communications between master stations may be authorized on a case-by-case basis and on a secondary, non-interference basis, on the same MCS frequencies used in point-to-multipoint operations. However, the use of MCS frequencies which uniquely satisfy a point-to-point requirement, will not be allowed. 5.8 Frequencies for mobile master stations may be permitted for assignment only with adequate justification and without expanding the service area. The assignment of these frequencies are based on the condition that there is no interference from MCS mobile master stations to MCS fixed operations. 5.9 Mobile remote stations would only be permitted ancillary to fixed remote stations. Such mobile remote stations would only be permitted to communicate with fixed MCS master stations and cannot expect the same degree of protection as fixed stations due to their varying operating environment. On any authorized frequency, the average power delivered to an antenna shall bethel amount of power necessary to carry out the communications desired within the limits specified below. 6.1.1 The transmitter output power for remote transmitter(s) shall not exceed 5 watts (7 dBW). 6.1.2 The transmitter output power for fixed master transmitter(s) shall not exceed 100 watts (20 dBW) when an omnidirectional antenna is used and 20 watts (13 dBW) when a directional antenna is used. The Effective Radiated Power (ERP) for fixed master station(s) operating in the bands 941-941.5 MHz and 952-953 MHz shall not exceed 250 watts (24 dBW) when an omni directional antenna is used. When a directional antenna is used, as per Canada/U.S. Arrangements the Effective Radiated Power (ERP) for fixed master station(s) in the border area shall not exceed 600 watts (27.8 dBW), and 2500 watts (34 dBW) beyond. The minimum co-channel reuse distance between two fixed MCS master stations normally shall be 135 km. A directional antenna should be employed at each remote site. Exceptions may be made upon adequate justification. A minimum front-to-back ratio (F/B) of 15 dB will be assumed when a directional antenna is used. This (F/B) will be the basis of the geographical distance between two master stations and carrier-to-interference (C/I) calculations. These limitations are not applicable for MCS mobile remote antennas. Equipment operating on 25 kHz channels must meet RSS-119. Transmitters operating on 12.5 kHz channels must meet RSS-122, while receivers operating on 12.5 kHz channels may optionally meet RSS-122 or RSS-119. 7.1 In cases where the co-channel reuse distance criterion in 6.5 is not met, the Department will perform an EMC analysis to determine if the proposed assignment could co-exist with other existing or previously applied for MCS systems. Note: The channels listed may b e available for mobile master transmit. The power limitations in Section 6.4 apply to the mobile master stations. Note: The channels listed may be available for mobile master transmit. The power limitations in Section 6.4 apply to the mobile master stations. 1 For the purpose of this SRSP, harmful interference means interference which endangers the functioning of a radio navigation service or of other safety services or seriously degrades, obstructs, or repeatedly interrupts a radio communication service operating in accordance with regulations and technical requirements laid down by Industry Canada under the Radiocommunication Act . 2 Note that in SP-GEN, a system with two or more remote sites is considered as an MCS system. 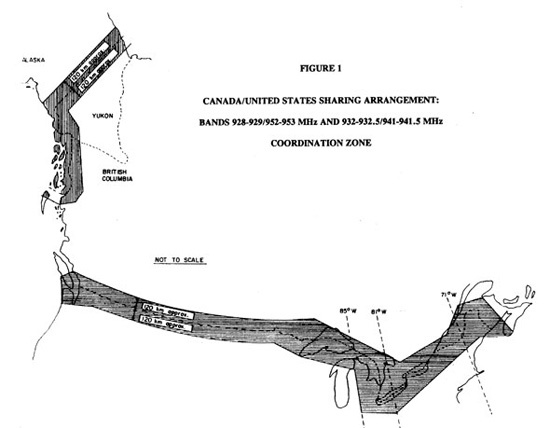 This figure shows a partial map of Canada and the United States, illustrating the Coordination Zone according to the Canada/United States Sharing Arrangement for use of the bands 928-929/952-953 MHz and 932-932.5/941-941.5 MHz. The Coordination Zone is the area adjacent to the Canada-United States border, extending a distance of approximately 120 km within either country.